Looking for the perfect gift for the die-hard Chicago White Sox fan? You've come to the right place! Our Personalized Family Cheer Chicago White Sox Wall Art decor is a great way to show one's love for family — and their love for their favorite Windy City team! 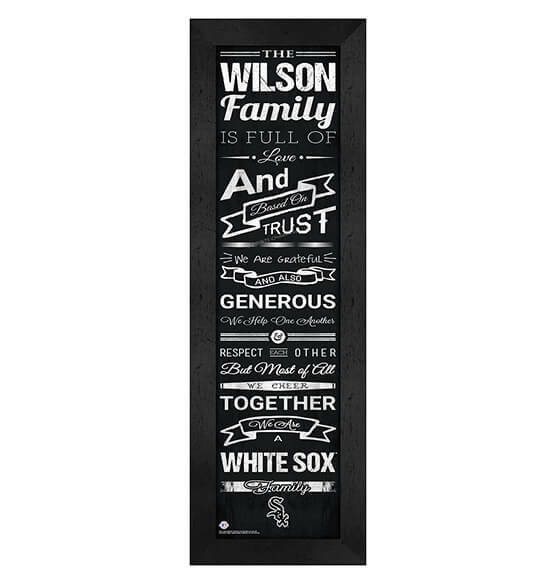 Whether you purchase this custom decor for yourself, for family or for co-workers, this high-quality MDF vinyl-wrapped frame, paper and glass features ChiSox team colors and heartwarming family sayings. Our premium sports decor arrives ready to hang with an included sawtooth hanger that makes home decorating a snap. PersonalizedThings by Exposures is here to help you celebrate life's memories!